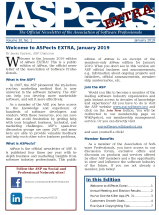 ASPects has been the newsletter of the Association of Software Professionals since 1988, serving both as the publication of record for reporting news, official business, and member benefits to the membership, and helping members to create and sell software using the marketing methods of try-before-you-buy and many other marketing methods. 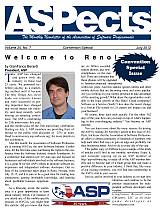 The entire archive of ASPects issues are online for our members. ASPects contains confidential and proprietary information, and so is normally not available to non-members, but one issue per year is available publicly. Several of the most recent convention special issues are available for download in PDF format–click any cover image below to read the issue. You’ve got the Killer App. Now What? Watch Out! Email isn’t the same as Paper Mail! Do You Know What It Takes to Succeed in the Software Business? Are you thinking about starting your own software business? Are you worried about unanswered questions regarding the process of doing so? Are you concerned about the risk? I’ve been seeing annoying apps this year.A lot of them. Really, I should install an app for Sheetz? Really? Hello, it’s a gas station with hot dogs, and road-side billboards that tell me to install their app. Why? The recent passionate discussion in the ASP newsgroups- “The million dollar question–To charge for updates or not?” inspired me to write this article. ASP Conference Manager With new owners, a new nickname, a new location, a new venue, and even a new website, the Software Industry Conference is being reborn! 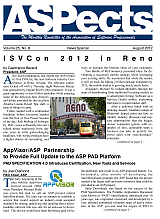 An entire software industry flourishes now that has been built on top of the ASP specification of PAD. The Portable Application Distribution changed the way the software authors and distribution sites publish product information. Before PAD, authors provided descriptions to web sites one-by-one, dealing with unique description requirements and agreements for each distribution opportunity. But software has radically changed, the methods of distribution have changed, and the needs of sites who have built their business on the PAD platform have changed. Many years ago, a friend was grumbling about the things we did to configure our computers. It was mostly downloading programs that could do things with types of files that were newer than what the operating system knew about–this was in 1981, by the way, and the computers were not IBM compatible. Nothing has changed…. 2. Get them to download your software. 3. Get them to purchase your software. You’ve joined the party! You’ve heard that Twitter is a free and easy way to promote your business, and so you’ve signed up for a Twitter account to promote your business, added a profile picture and a bio, and followed a number of interesting people. You even have people following you back. Now what? There are a lot of theories about the effectiveness of photos, drawings, and other illustrations on software developers’ web sites. For example, some microISVs believe that including stock photographs is a great idea, while others believe that including these pictures would hurt their software marketing efforts.